I think you know how to search with many search tools, and maybe you use several browsers to surf online, but I guess maybe you have never use a tool to browse or search with 3D screen. 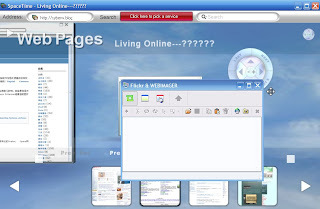 Spacetime gives you this kind of experience, you can use its tool to browse any website with one window but different tabs, and they are sliding in 3D. You can also use it to search on Google, Yahoo, eBay, Amazon, Youtube and so on. While you use image search it can store pictures, that lets you feel you have a 3D space online. It is really cool. If you want try you can download this tool PREVIOUS VERSION on its website.